Over the past week i found myself once again in the cinema. This is becoming a very regular occurring for me it seems! Up until i started to talk about the films i have been watching here on my blog, i didn’t really go to the cinema too often, that was also partially contributed to the fact that there wasn’t too many decent / interesting films out at the time. But i feel more up to seeing films these days! This week i went to the local cinema to see Rise of the Planet of the Apes, i managed to go at a bargain of a price, tickets were only €4 thanks to o2 (Irish Phone Network) and including my popcorn and drink it was a little under €10, i can’t remember the last time i spent so little in the cinema! For once i wasn’t broke leaving the place. I had been really looking forward to seeing this film, i had seen a lot of preview trailers on TV, when going to see other movies in the cinema and of course through YouTube where a large campaign was setup with the popular YouTubers who go to see the behind the scenes stuff which helped create a lot of buzz around the film. So before going to see the film i had heard a lot of things about it, some people had good reviews, while other had other opinions. As usual i like to form my own opinion of a film, you could tell me it was terrible, but i had intended on seeing it i would watch it anyway, no matter what the reviews were! The plot of the film is fairly simple (probably going to have spoilers so skip this paragraph if you haven’t seen the film! ), scientists are have been trying for years to try and find a cure for Alzheimer’s Disease, they think they have finally achieved a cure and were testing their treatment of Apes/Chimpanzees. Unknown to them the cure had other effects which not only led to a cure of Alzheimer’s but also improved peoples cognitive abilities, a chimpanzee happened to be the first user of the new Alzheimer’s drug and began to show rapid development and soon became smarter and smarter over time. Later this ‘super-intelligent’ chimp gets forced into a cage where other chimps & apes are being held and realises how different he is and sets out to set them free from the people who are keeping them captive and choose to rebel against the human race in order to gain their freedom. 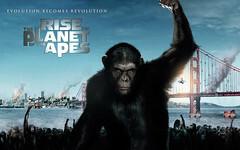 I thought this was a brilliant film, really interesting to watch, the special effects used were brilliant, the effects i refer to are the fact that humans play the role of the apes and are then digitally made into apes on computers as opposed to simply making the apes fully on the computer. I feel that by using a bit of both it makes it more realistic with the movements etc. There are a few great actors in this film, i am sure others are popular but i haven’t seen any films that i would recognise them from. The three i recognised are James Franco who played the likes of Harry Osborn in the Spiderman films, Tom Felton who played Draco Malfoy in the Harry Potter Series and John Lithgow who up until recently i only knew him for the role he played in the TV-Show Dexter which he acted brilliantly in, but i looked him up and realised he has been in a lot of popular films, one that i was surprised to see was that he played the voice of Lord Farquaad in Shrek! I would never of guessed it was him, i will have to listen out for him next time i watch those films. Overall i really enjoyed this film, it’s something different i felt from other films i have watched, especially given that the main stars of the film are animals! If you haven’t already seen the film, i highly recommend this one, you won’t be disappointed! Again here is the trailer below! And on another note, if this ever happened, we would be screwed! Last weekend was the premiere for the new Inbetweeners film. I have been looking forward to this film for a while now. This originally started as a TV show and after three seasons it has ended with a film. The film is about how the four lads have just finished up with school and are going out into the world. Just before they take the dive into going on into college or getting a job they decide to go on a lads holiday to Crete, their first holiday with their family! As expected this film is hilarious and full of plenty of ‘cringe’ moments, if you can watch any of the episodes without having some reaction in your head saying ‘oh god no!’ then fair play to you! This is a film that i would highly recommend going to see, if you like that sort of British awkward humour or any comedy in general, then this is the film for you. Apparently the film t cost about £3.5 million to make and after just its first weekend it has already raked in over £13 million, which has pushed it to the top of the list, which is now the highest grossing uk comedy during box office week. I can only imagine that it will earn a lot more and i reckon it will win an award or two. You can also tell how current the film is, the music used in the film is really up to date, whenever you watch films the music that is in the Inbetweeners is not heard too often. My favourite scene in the film is by far neill, simon and will doing their dance! I went had to go see this film in another town (Newry) as the local cinema where i live for some reason refuses to bring in certain films, supposedly it is something to do with an argument they had with one of the supplies about pricing and now for the past few years the cinema has missed out on some pretty big films including The Inbetweeners. I reckon they should just pay the asking price because they would definitely make their money back, especially with the prices they charge! This week i got around to watching a film that i have wanted to see for a long time. Every time i go to watch a film i would pick up the case for Eternal Sunshine of the spotless mind and then decide not to watch it because people always say you either love it or hate it, lots of mixed reviews and from what i got from people telling me about it was that it wasn’t the most easy watching film, so usually i would just put the film back down. But this weekend i finally watched it, i had never actually read anything into the film before, all i knew was what was written on the back of the DVD case, other than that i was completely oblivious to what the film was or how it was filmed in a similar fashion to that of Donnie Darko meets all other films that try to mess with your head and get you thinking sort of way. Now don’t take it that the film is like Donnie Darko in the sense that it is really dark, i mean in the way that Donnie Darko has the under lining meaning or story-line to the film, eternal sunshine has its story-line like this too. Eternal Sunshine is a sort of two in one film, it is about romance and heartache. The romance part comes when two people meet randomly after, Joel, the main character, played by Jim Carrey, decides to ditch work and ends up at a beach. Later the heartache factor comes in where Joel comes to realise that the love of his life, Clementine, has had all her memories of him removed. It all becomes to much for Joel and he too decides to opt in for the same treatment that Clementine had done, only to realise he has made a huge mistake. This film really likes to play tricks with you, as i have said already, the film makes you think something is happening one way, however in fact there is a completely different storyline being told right in front of you, but it takes a while to work out what exactly is going on. I really enjoy these kinds of films, anything that gets your mind working is good in my books! As for the statement that people say its either a love it or hate it film, i totally disagree, nothing in my opinion is too obscure than other films, this film has been written by someone who obviously has a great mind for complex story-lines. I suppose if you like to watch more brain dead films that require no intellectual thoughts then this film wouldn’t be for you, but for the majority of people, its a great film and gives you something to work at while watching the film, finding out what exactly is being shown. There are a lot of popular actors in this film including Jim Carrey, Kate Winslet, Kirsten Dunst and Elijah Wood. The camera work is brilliant in this film in parts, in one part camera manipulation is used to make fully grown adults look the size of a 10 year old, usually computers are used to achieve this kind of effect, but if you watch the bonus features of the films you can see how the trick is done. Here is the trailer below. The official music video for Eternal Sunshine and the Spotless mind is by polyphonic spree and is called Light & Day, the video is odd the way it is made, if you were to come across it you wouldn’t think it is the official video for the film, the only reason i know it is, is because it is on the DVD. The music video is below. What’s your view when it comes to speed cameras? I think speed cameras in Ireland are a disgrace. They might as well not exist at all because there are so few of them! I know that recently a new initiative was set up to increase the amount of speed cameras across Ireland by deploying speed vans which will “randomly” pop up on roads. First off I think this approach is ridiculous, if speed cameras are to be put on roads, they should come as a surprise to the toad users. At the moment you can actually go onto the Garda website and view a map of where all these new speed camera are, maybe not the exact location, but you are given a radius of where the vans will be, I think this is pointless. I think that all speed cameras should be more discrete, the Idea of then is to catch speeders not warn them of what part of the road to slow down on. I think if you aren’t warned then when you get caught you will think twice the next time. The more the person gets caught, the more it will sink in and if they still don’t recognise the fines and penalty points, then their license gets removed and that’s then off the road. By having the camera more discrete it will increase the amount of people caught and could eventually make the roads safer. For example, I drive a fair distance to and from work, on the way up to work there are a grand total of 2 fixed cameras, and I have yet to see any speed vans on the way to work. On the way back from work I take a different route, taking the different route makes me pass a total of 0/none/zilch fixed speed cameras! That’s a disgrace, however every so often there is one speed van on a certain road. Everyone knows about this van and slows down in that area, once they pass it, they proceed to speed up again. So of this speed van is not their one day, the. I can go the whole way home without seeing a single van! That’s an hour and 15 minute journey for me, and not a single camera! I think that if Ireland is to bother with speed cameras, they should be implemented the same way as England. You can’t go to far without seeing a speed camera, they are everywhere! It’s great, sure they might delay your trip, but to be honest, speeding doesn’t really get you that much further. You will eventually catch up with traffic and lose all the progress you made whilst the people you overtook will gradually catch up, apart from the distance the other thing that you are wasting is money, going they extra bit over the speed limit will cost you a fortune, especially the longer you speed. I don’t mind sticking to the speed limits, that’s it! If anyone else has an opinion on this topic I would be interested in hearing about it! Let me know either here on my blog or twitter and Facebook! Movie Monday – A Marathon! Since last week i have watched so many film, i seem to be getting more into watching films these days. Even though i have only started doing these Monday ‘challenges’ for me to watch more film i feel like it is working. When i first started with these blog posts i said that i rarely find time to sit down and watch a film, now though or at least in the last week i have gone mad watching films. So for today’s Movie Monday, i have not just watched 1 film, or just two but 5 films in the last 7 days! Thats just insane! and unheard of for me. I now enjoying sitting down and relaxing after work and throwing on a film, but for the most part of the films i watched over the last week, the majority were on T.V! Thats an even more uncommon thing for me, i never watch films that are on T.V, i hate watching films when there are ads in them! and i was surprised to see so many films that i like were on T.V. Out of all the 5 films i watched, only 2 of them was new to me, all the other ones i had seen previously, but i liked them so much that i decided to watch them again, couldn’t resist watching them when i saw that they were coming on T.V. The first film i watched was last monday night, the film was Children of Men, this is a brilliant film. I first saw this film a few months back, my brother showed it to me. If you havnt seen this film i would highly recommend that you do watch it. The film’s plot revolves around the concept that humans have not been able to reproduce for years and when a young woman manages to fall pregnant, the film follows her on her journey. The camera work in this film is amazing, in one scene the camera shot must go on for about 10 minutes straight without breaking, which gives a powerful impact and makes you really aware of what is happening. The next film i watched stars Robert De Niro and Cuba Gooding Jr., the plot of this films is about the first African American to become a Navy Diver. The story of Carl Brashear, the first African American, then also the first amputee, US Navy Diver and the man who trained him. Speed is a film i heard a lot about but never got around to watching it. This film came on T.V last week and myself and my family sat down and watched it. To be honest it wasnt for me, i had always wanted to watch this film but i didnt really enjoy it. I found it more humorous than i should have, its probably the fact that its a relatively old film and the acting and style is just old and cheesey and the plot and how it is performed is insane and simply impossible. I am still glad that i have managed to see the film, and i might watch the next film in the series, Speed 2, not sure if it is going to be an improvement but i might as well give it the benefit of the doubt! A young cop must prevent a bomb exploding aboard a city bus by keeping its speed above 50 mph. Speed has some great actors in it thought, including Keanu Reeves, Dennis Hopper and Sandra Bullock . The guard is the second of the five films that i hadnt seen before last week, this is the newest out of the lot, it is still in the cinema, so i made sure i went to see it. i had heard a lot of good feedback about the film, and seeing that it is an irish film i had to go and check it out, you know, support the local cinema! The film obviously follows a guard around, and the plot is how a drug smuggling group re trying to get drugs into Ireland, with Brendan Gleeson playing the main actor, he is out to find out the truth. This film is hilarious and simply one of the best films i have seen in a long time, and probably the best Irish film that i have seen. The cast also includes Don Cheadle who plays the role of an FBI agent who has been following the drug smuggling operation for some time now. You would recognise Don from films such as Iron Man and Reign over Me. An unorthodox Irish policeman with a confrontational personality is teamed up with an uptight FBI agent to investigate an international drug-smuggling ring. The final film which i watched last week was the Social Network, a film based on the success of Facebook and follows how the idea came about and through to the success and court cases revolving around Facebook. I have lost count to the amount of times i have watched this film, i really enjoy this film, i like the storyline although bits have been changed to dramatise the storyline a lot. I watched this film with a friend of mine who had not seen the film, i especially enjoy the watching the special features of the film, it shows the challenges of filming the social network along with how special effects were used to replicate one actor to play both the twins in the film!